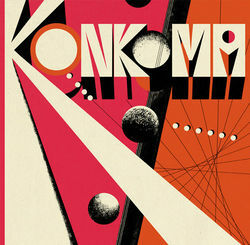 London based Afro-funk outfit KonKoma will release their self-titled debut on Soundway Records on June 25th. In advance of this, KonKoma will make their live debut at The Rich Mix in London on 1st June (see below for details). Rooted in 1970s Ghana, KonKoma is the brainchild of saxophonist Max Grunhard and producer Ben Lamdin (Nostalgia 77). The idea was to create a band around two highly esteemed Ghanaian musicians - Alfred Bannerman and Emmanuel Rentzos. Both are mercurial talents who over the years have graced the stage with the likes of Bobby Womack, Hugh Masakela and Peter Green as well as being long term members of the Afro-rock band Osibisa, but it wasn’t until KonKoma that the two old friends have had a band built around them. The English-speaking West African country was the destination of Soundway’s acclaimed compilation series Ghana Soundz Afro-Beat, Funk And Fusion in 70’s Ghana. It has been a long held ambition for the label to work with a contemporary Ghanaian band who can push the country’s unique take on Afro-beat and highlife forward. KonKoma adds a progressive edge to their rich blend of Afro-funk, jazz, soul and traditional African rhythms as well as acknowledging the 70s recordings that spawned the sound. Produced by Max Grunhard and Ben Lamdin, the album was recorded and mixed by Mike Pelanconi (aka Prince Fatty) in Brighton. Guitarist Alfred Bannerman, founding member of teenage Afro-rock band Boombaya (featured on the Soundway compilation Ghana Special) has remained one of the mainstays of the UK’s African music scene for more than 20 years. Keyboardist Emmanuel Rentzos has been playing alongside his fellow Ghanaian since the early 1970s when he was the lead singer of the young Ghanaian outfit Santrofi’s band. Once Max and Ben had won the support of Alfred and Emmanuel, Ghanaian musicians and now key members of KonKoma, Nii Tagoe and Reginald ‘Jojo’ Yates came on board.